90” gargantuan edge-lit LED TV from Sharp with fast action AquoMotion 240 for the sports crazed. 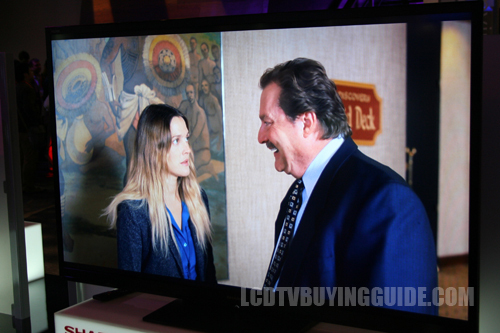 Sharp is producing the largest available TV yet from LED/LCD technology with the 90” Sharp LC-90LE745U. Features include 240Hz response rate, 1080p resolution, Aquos Advantage live, Wifi built in, active- shutter 3D compatibility and Smart Central Internet. Sharp continues to ratify its position as the producer of extremely large LED/LCD TVs - successfully too. Video processing in the LE745U series is very good with good, clear image edges and little processing noise. The 90” model will certainly test video engine processing as everything will show up on a screen this large with bright LED backlighting. Black levels are not the strongest and you will notice some haziness to the blacks depending on where you set your contrast and whether or not you want good dark shadow detail. Aside from that, the real weakness as far as the picture goes is with the side angle viewing where we see contrast diminishing starting at around 30 degrees off center. Of course, since this set is 90” it is more difficult to move off center - so there is a plus in the size without even trying. Color rendition looks good, but not the best. Overall, the picture is very solid, just not the best you will see available in other sizes. 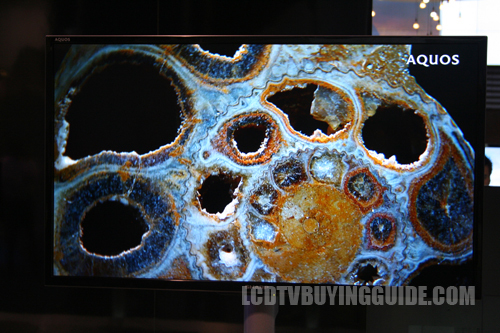 The active 3D on this massive television send full 1080p resolution to each eye so the LC-90LE745U doesn't sacrifice any detail in 3D and the image has plenty of depth. 3D works really well on a very large screen and it will definitely immerse you in the programing. We did not note much flicker and little to no crosstalk in the LE745U. Fast action scenes display very nicely on this display without motion lag or trailing artifacts. Slow camera panning side to side shows a little jerkiness, but it is much better than it would be otherwise due to the AquoMotion 240 feature. There are few side effects from using this feature, and we recommend it. It would be a major disappointment to produce an ugly 90” TV. How could you live with an ugly design in a TV that size? Thankfully, that is not the case with this model. The LC-90LE745U has a black brushed aluminum metal bezel framing that is both classy and stylish if not a touch understated. Just to let you know how big 90” diagonal is, try 6 feet wide and 4 feet high. It's relatively thin as well and the matte finish leaves no annoying glare from in-room light. Sharp's built in Wifi comes in handy in the LC-90LE745U to connect to the Smart Central Internet options for 2012. Sharp has a pretty well rounded Internet TV suite that they also call "Smart TV". It has most of your standard featured paid and free services that are prominent in the industry such as Cinema Now, Netflix, Vudu Movies, Blockbuster on Demand, Facebook, Twitter. Sharp not only produces the largest screens but has become very value oriented in the past couple of years. However, initial estimates on the LC90LE745U look high. Keep in mind the 70” LE745U is around $2699 in price - an exceptional value and Sharp's own 80” LE844U is just south of $5000. There are no other comparisons for this size TV.